Old enough to know how to have fun! 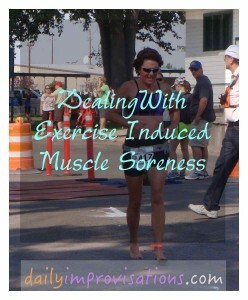 Developing some exercise induced muscle soreness during the Emmett Sprint Triathlon 2 years ago. 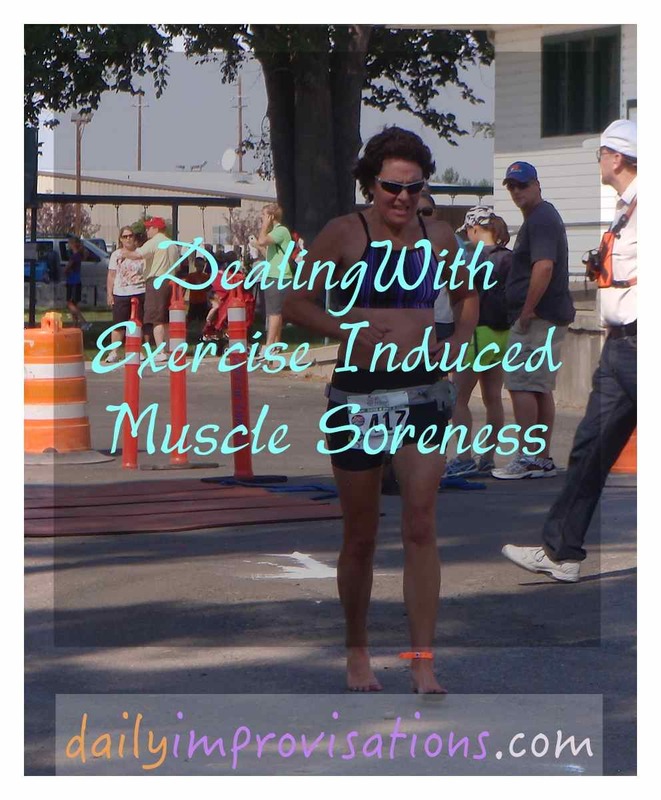 By specifying exercise induced muscle soreness, I mean muscular discomfort or pain that is not due to injury or disease, but is rather from proper use of the muscles to a greater effort than they are accustomed to. Some people say that such soreness is because of injury or breakdown of the muscles because of some degree of overuse, but I will stick to defining injury as a condition that is a more obvious and debilitating; something that most people would easily describe as broken or hurt to significantly inhibit function until healed. Exercise induced muscle soreness may be preceded by intervals of muscle exhaustion, but that is still not the same thing. If a body is used to higher intensity activity, it may not result in significant muscle soreness even if there are repeated periods of rest needed. I will give my dancing as an example. I can go out and dance vigorously for a total time period of 2-3 hours, needing only occasional times of rest when my legs communicate to me that they need a break. However, I do not usually have any sore muscles the next day, since this is an activity and intensity my body is familiar with. Thus, the build up of lactic acid from more anaerobic intervals does not necessarily cause muscle soreness. 1. Make increases in specific activities gradually. Don’t let impatience or social pressure push you to increase your efforts with such unwise mantras as “no pain no gain.” That is one of the most injurious slogans anyone ever came up with. It is always better for the body to get stronger at a moderate rate. For one thing, pushing too much past former limits is more likely to lead to true injury, as exhaustion on many levels make it hard for the muscles to do what you are asking them to do. 2. After a training session that does work on expanding your limits, make sure to keep moving regularly, but somewhat gently, for a few hours afterward. This avoids painful stiffness from the muscles tightening up in response to the effort. It also keeps the blood flowing to the area to service the well-used muscles. They need circulation to recover. 3. Apply heat, as I discuss in this post about why I take warm baths and NOT ice baths after working out. Again, it goes back to circulation. The soreness may technically be inflammation, but inflammation is wrongly labeled as inherently bad. Inflammation is what the body needs to deal with things. On rare occasions it may require controlling, but if it is that bad, you probably need to rest and recover on a whole different level. On a side note, some people recommend Epsom salts for the warm baths, but I am skeptical of this being helpful. This article thoroughly explores why Epsom salt probably does not do what many people think. 4. Massage and use trigger point concepts to both increase circulation and release tension points that may have developed in stressed muscles. If you are constantly getting knots in your muscles in the same places, you might want to evaluate how fast you are increasing your effort or whether or not you are too tense while exercising. 5. Get plenty of sleep. Sure that may be different for different people, but schedule to let yourself sleep long and hard for you after a particularly challenging workout. Sleep is a magical thing that brings much restoration. 6. Do some light stretching. I’m not talking about bouncing or putting force on your muscles that might make them snap. Much like just moving in general, some specifically related gentle stretches done periodically can relieve some of the muscle tension and discomfort. If you already do something like yoga or gardening, think about making sure you get into positions that carefully stretch the muscles in question. 7. Do a relatively easy workout the following day. Unless you have really overdone it, a light effort is better than no effort at all, in my experience. It often helps if it is a different form of exercise, that works some of the same muscles, but in a way that relieves them of the full burden. For me, biking helps after an intense run day. Swimming is good both the day of and the day after a harder run. These strategies, combined with the idea of slowly building my aerobic base, have significantly reduced both my overall muscle soreness and tendency to injure myself. I hope they do the same for you! Feel younger, no matter what your age, and have more fun being active! Get a free copy of my FFAF Fabulous Mini-Manual filled with tips! This will also sign you up for the Fun Fitness After 50 Newsletter for regular encouragement. Sign up now! If you want to know more about what I’m up to, here is a summary! All pictures and content including the name and logo “Fun Fitness After 50” are Copyright (c) 2019 by Laura Blodgett, unless otherwise noted. Please contact the author with any questions or comments. I’d love to hear from you! You can send me a message by clicking here.